I guess the cat's out of the bag on this one so I might as well post it here too. 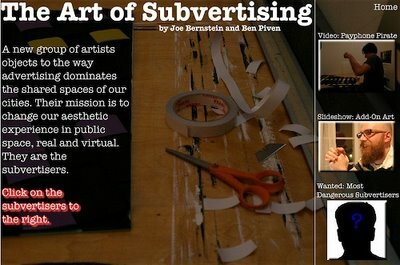 This interactive piece was done by Joe Bernstien, and Ben Piven on the fine art of Subvertising. In it I install another weaving piece and Steve Lambert gives a brief explanation of his Ad Art Firefox hack. Thanks again to both of those guys for taking interest in our projects.